The Center for Public Health Practice engages in research and evalution that impacts Indiana and beyond. What’s Oxymorphone Got to Do With It? From 2004 to 2013, only five people were diagnosed with HIV in Scott County. From December 2014 to January 2015, 11 people were newly diagnosed with HIV. By October 28, 2016, 210 people were diagnosed with HIV. All were linked to Austin, IN. Nearly all had experience injecting OPANA® ER. Infections were recent and from a single strain of HIV. 199 (95%) co-infected with Hepatitis C.
This poster aims to identify risk factors for HIV infection and inform control efforts. 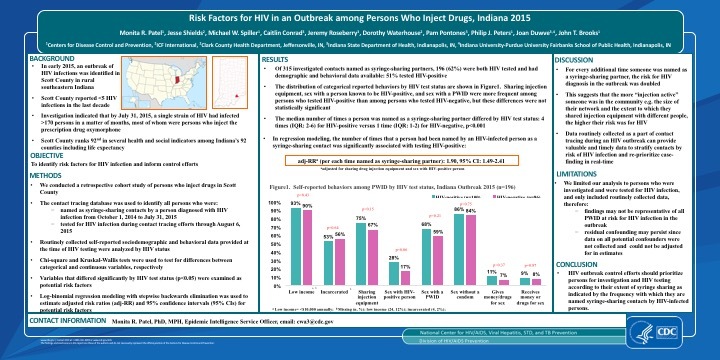 In early 2015, an outbreak of HIV infections was identified in Scott County in rural southeastern Indiana. 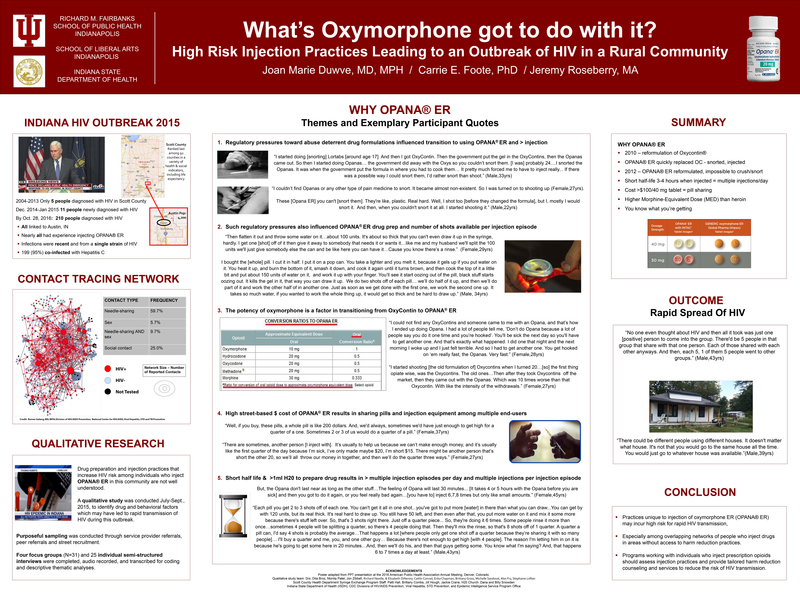 Investigation indicated that by July 31, 2015, a single strain of HIV had infected >170 persons in a matter of months, most of whom were persons who inject the prescription drug oxymorphone. Scott County ranks 92nd in several health and social indicators among Indiana’s 92 counties including life expectancy.